KIT: Leak Detector with Heated Diode sensor. Wall & Car charger. The SRL8 Heated Diode Refrigerant Leak Detector is designed exclusively to make the HVAC/R Technician's job easier, faster, safer and more efficient. 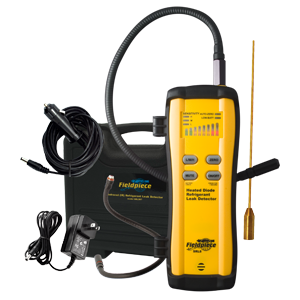 We set out to develop the best heated diode leak detector for HVAC/R. We believe the SRL8 is it. It comes in kit form in a rugged, blow-mold case with all of the extras you don't get from the other guys. (see What's Included?). Up and running in 30 seconds. Some heated elements and corona discharge units take much more time to warm up. UV dyes can take several hours to travel through a running system and can degrade system components. Three sensitivity levels from 6.6oz/yr to <0.1oz/yr. Heated Diode Sensor lasts up to 5 years (depending on use and exposure). Work all day and all night on one charge. Battery life check. See how much charge you have left by looking at the LED display. LED and Audio alerts. Find leaks in noisy environments. Mute: Turn off the sound when you don't want anyone to hear what you're doing.